A laser communications experiment flying on NASA's newest moon probe is now a record holder. The Lunar Laser Communications Demonstration (LLCD) — a technology test flying on NASA's Lunar Atmosphere and Dust Environment Explorer spacecraft, or LADEE — has set a record for the fastest download rate between the moon and Earth. "The goal of LLCD is to validate and build confidence in this technology so that future missions will consider using it," Don Cornwell, LLCD manager at NASA's Goddard Space Flight Center in Greenbelt, Md., said in a statement. "This unique ability developed by the Massachusetts Institute of Technology's Lincoln Laboratory has incredible application possibilities." Laser communications technology could help NASA scientists communicate with farflung spacecraft in the future, allowing rapid and high-fidelity downloads of 3D images and high-definition video from distant parts of the solar system, NASA officials have said. 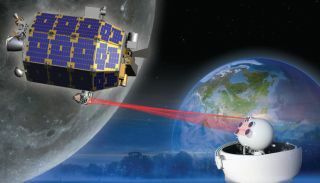 The LLCD is not the first laser communicator to leave the planet, although it is the first dedicated laser communications instrument of its kind. NASA used a laser to send a picture of the Mona Lisa to the Lunar Reconnaissance Orbiter circling the moon. "LLCD is the first step on our roadmap toward building the next generation of space communication capability," Badri Younes, NASA's deputy associate administrator for space communications and navigation, said in a statement. "We are encouraged by the results of the demonstration to this point, and we are confident we are on the right path to introduce this new capability into operational service soon." LADEE launched on Sept. 6 from NASA's Wallops Flight Facility on Wallops Island, Va. The probe is tasked with investigating the moon's thin atmosphere and helping to solve a moon dust mystery dating back to before the Apollo era. Astronauts noticed a glow on the lunar horizon before sunrise, and scientists think it may have been caused by particles of dust, a claim that LADEE will investigate during its 100-day science mission.